ISTANBUL (Reuters) - Turkish Prime Minister Ahmet Davutoglu on Thursday compared Israeli counterpart Benjamin Netanyahu to the Islamist militants who killed 17 people in Paris last week, saying both had committed crimes against humanity. Davutoglu said Israel's bombardments of Gaza and its storming in 2010 of a Turkish-led aid convoy headed there, in which 10 Turks were killed, were on a par with the Paris attacks, whose dead included shoppers at a Jewish supermarket. The comments at a news conference escalated a war of words between the former allies: Israel's far-right foreign minister, Avigdor Lieberman, called President Tayyip Erdogan an "anti-Semitic bully" on Wednesday for criticizing Netanyahu's attendance, with other world leaders, at a Paris solidarity march for the attack victims on Sunday. Separately on Thursday, Turkish President Tayyip Erdogan's spokesman issued a statement saying it was Islamophobic and unacceptable for Netanyahu to link the Paris bloodshed to Islam. "The Israeli government must halt its aggressive and racist policies instead of attacking others and sheltering behind anti-Semitism," spokesman Ibrahim Kalin said on the presidential website. Turkey condemned the Jan. 7 attack on the French satirical weekly Charlie Hebdo, in which Islamist gunmen killed 12 people, but has also warned that rising Islamophobia in Europe risks inflaming unrest by Muslims. Davutoglu also attended the Paris memorial rally, which he said was a march against terrorism. "Just as the massacre in Paris committed by terrorists is a crime against humanity, Netanyahu, as the head of the government that kills children playing on the beach with the bombardment of Gaza, destroys thousands of homes ... and that massacred our citizens on an aid ship in international waters, has committed crimes against humanity," the Turkish premier said. The assault on the aid convoy ruptured relations between Turkey and Israel, which previously enjoyed close diplomatic and military ties. Trade links remain close. Israel fought a 50-day war with the Islamist Hamas-ruled Gaza Strip last year, with Israeli shelling and air strikes causing widespread devastation in the tiny territory and Hamas firing thousands of rockets into Israel. More than 2,100 Palestinians died, mostly civilians, Gaza medical officials said, while the Israeli death toll was 73, mostly soldiers. "If Israel is looking for a bully, it needs to look in the mirror," said Davutoglu, whose Islamist-rooted AK Party has held power in Turkey for over a decade. Last October, Israeli Defence Minister Moshe Yaalon pointed to what he said was a Hamas base of operations in Turkey, accusing Ankara of sponsoring terrorism and arguing that this was incompatible with its membership in NATO. Tensions are running high in Turkey over the Charlie Hebdo's cartoons mocking Islam, the reason cited for the shooting attack on the weekly in a claim of responsibility by al Qaeda in Yemen. Davutoglu also criticized the Turkish secular newspaper Cumhuriyet for publishing excerpts of Charlie Hebdo's latest edition, saying freedom of the press did not extend to insulting religious values, a crime punishable by jail in Turkey. Cumhuriyet's was one of five international versions of the "survivors' edition" of Charlie Hebdo, which bore an image of Mohammed on its cover, which is prohibited by Islamic convention. A Turkish court subsequently ordered four websites that featured the image to be blocked. 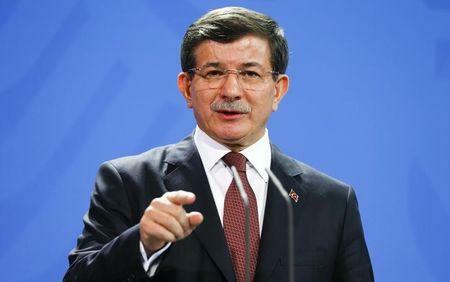 "Freedom of press does not include insulting the Prophet," Davutoglu said. "People who may tolerate insulting an individual will clearly not respond with the same degree when it is against the Prophet. Since Turkey has such a sensitivity, publishing a cartoon that aims to insult the Prophet is a clear incitement." Police secured the premises of Cumhuriyet after threats were made against the newspaper. Violence erupted at an Islamist paper, Yeni Akit, late on Wednesday after it published negative images of Mustafa Kemal Ataturk, who toppled the Ottoman sultan and founded the secular republic in 1923. Ataturk is a national hero for most Turks. Yeni Akit said about 200 nationalists threw eggs and rocks, then tried to storm its offices before police stopped them.